Medibank’s people and senior leaders have a special relationship with the Aboriginal community of Wadeye in the Northern Territory. At the top of the Northern Territory, 420 km south-west of Darwin, is the remote Aboriginal community of Wadeye – home to fewer than 3,000 people. In 2012, a group of senior Medibank leaders first travelled to Wadeye as part of a leadership development program. Alongside community partner Red Dust, the group met with Indigenous leaders, visited families living in the area, and experienced firsthand the workings of the health clinic and aged care facility, with the aim of learning about the complexity of health issues encountered by the community. 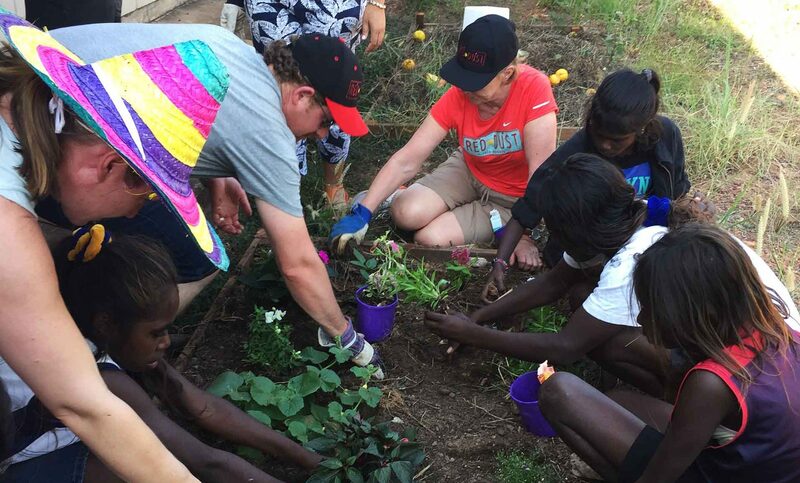 Over the following years, leadership groups from Medibank continued to visit with Red Dust to help out with community-led initiatives – such as Healthy Skin Week, a campaign to raise awareness around scabies. Medibank’s on-ground support involved assisting the Wadeye health clinic, visiting local families and contributing some essential community resources including topical medications and industrial and household washing machines. For Andrew Matthews, Medibank’s Chief Actuary and Co-Chair of the Reconciliation Action Plan Work Group, meeting the people of Wadeye has been a life-changing experience. “Working with local people, we learnt that we are all bound together in creating stronger communities and better health outcomes,” Andrew says. “We experienced first-hand the positive outcomes made possible when the strengths of the local community are engaged. “A highlight for me was the aged care home. In Melbourne I regularly visit my mum who lives in aged care. So I was curious about what happens with the elderly in Wadeye. I was made to feel so welcome having a cuppa and sharing a story with them. “I loved sharing stories with people like Christine, who at 70+ years old works a couple of days a week as an interpreter because she speaks English as well as multiple local languages. “You have to ask – do I see problems or possibilities? Yes the community has many problems – poverty, malnutrition, health, violence. They also have capacities – human, natural, financial, physical and social. To make meaningful change towards closing the Indigenous health gap, a truly collaborative approach with Aboriginal and Torres Strait Islander communities is essential. In recognition of this, Medibank’s engagement with the Wadeye community has evolved into a health planning tri-partnership with the local community and the Menzies School of Health Research. This means a deliberate move away from traditional, project-based support, towards the principles of co-design and co-creation, with the intention of putting the community at the heart of decision making from the earliest stage. Taking into account the social determinants of health such as housing, infrastructure, education and employment, the shared goal of this collaborative approach is to explore how Medibank might support a co-designed plan that orientates services towards priorities set by the community. The process is deliberately measured and requires listening and patience by all parties. It respects the value of the knowledge the community brings to the table and concentrates on getting things right. It is early days, but Medibank’s commitment to this new way of working means the process of learning and demonstrating a genuinely co-designed approach is as valuable as specific outcomes. Taking the time to build strong relationships with community and stakeholders now will get us all closer to sustainable reconciliation outcomes in the longer term.